by John Lovejoy, written in November, 2018. # Resist the erosion of our English identity, which is being displaced by ‘White British’ in The Press and in official communications. ‘White British’ is merely a State, or political designation, and does not indicate who we are. # Resist accusations of ‘Racism’, ‘Fascism’, ‘Far Right Extremism’, ‘Bigotry’, and so on. # Resist the belittlement and contempt for English History; for one thing, what we are doing now is even more daft than what went on before, but we English are hardly in control as things stand. # Resist the massive commercial and intellectual Americanisation of our people. # Resist the currently popular ‘Futurism’, which rests on the twin assumptions: (a) That Natural Science and Mathematics will ultimately solve all our human problems. (b) That ‘Progress’ is leading us to a wonderful future in which our children will be able to work on The Moon, settle on Mars or even exoplanets, while being able to modify our bodies and DNA to eliminate diseases, and to accomplish tasks which are currently beyond our reach. Who would be in control of all these things? # Resist the use of the term ‘British Values’, which is frequently put forward by politicians as a platform to unite all the various ethnic cultures and faiths: this is either self-contradictory on a strict understanding of ‘Diversity’, or else it is a reversion to the earlier sense of ‘British’ as an umbrella term to unite the English, Scots and Welsh – with the Northern Irish? In this latter case, ‘British Values’ has a clear meaning, but does not at all accommodate recently-arrived ethnic communities. # Anthropologically, it is a powerful argument that in a multi-ethnic State such as we now have, it is vitally important to have a core nation, with secure roots in the more distant past and a rich cultural heritage, to which the more recent incomers can respect and try to relate to. This can only be The English, along with our sister indigenous nations, of course. # By every means emphasise the six hundred years or so of Anglo-Saxon history in this land as an effective deep foundation and starting point for The English. This accounts for over a third of our known history! # The Conversion to The Christian Faith occurred in the First Millenium, and was brought to our shores from the Church’s original homelands in Asia Minor, Greece and The Levant. Also from Ireland, yes, but there is a strong argument that Ireland had originally been evangelised from Alexandria. The urgent point here, is that the long fragmented forms of ‘Western’ Christianity in this land should work together to regain the integrity and unity that they began with in the Seventh Century. Also, detached sects and DIY churches – many from the USA – should be shunned. Simply then, ‘Return to your Origins’. # Re-emphasise our own music, literature, poetry, and all other arts, from key periods in our history. The various arts may then be used to express all the other things we want to say! # Lastly, if our detractors try to vilify us for insisting that we are English and belong to the English Nation – perhaps saying that such a claim is blatant Nationalism, and that it has no place in today’s world – then this can be met with a counter-accusation of double standards! How is it that British citizens from most if not all of the recently arrived ethnic minority groups are very proud of their own respective cultures and inherited identities, which doubtless they wish to hand on to their children. Some of these will indeed not be ashamed to style themselves ‘Nationalists’. In saying this, we must recognise that many persons from the ethnic minorities are well able to see these things, while at the same time, those whom I have called ‘our detractors’ include many who are so deculturised that they are either careless of their own identity, or else, because of lack of transmission, are wholly unaware who they really are – despite being English by descent. 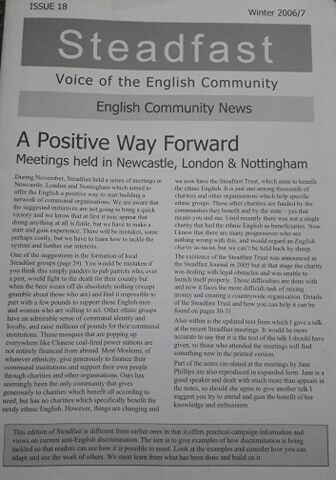 Probably, we have to begin by insisting on the use of the terms ‘The English’, ‘English Ethnic Community’, ‘English People’, ‘English Nationalists’, and make sure that they enter the public consciousness. That is all I can usefully write on general matters with English reference: with sufficient time and energy, doubtless there might have been much more! The news about my medical state remains somewhat grave, and currently I have just started a course of chemotherapy. I am on my feet, but after a period of physical activity, I then have to lie down for a while, until I recover. Most DIY is now out of the question! That said, I reached 83 last year, without sickness, so I can be thankful. True, I did have malaria in Nigeria in 1973, but there was no re-occurence once I left that country. 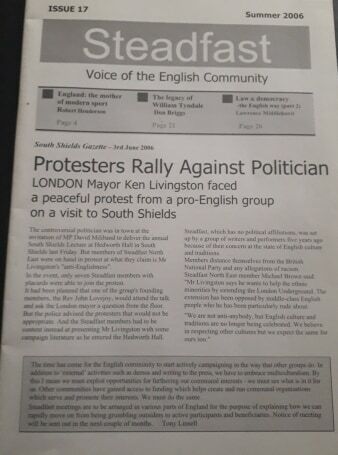 Lastly, thanks ever so for sticking with me, thus encouraging me to be sure, at this stage of my life, that there are those who care about The English, their own people, and that this will continue so to be. The torch must be handed on, and may the flame burn ever brightly! Next Post Brexit delayed forever?